This handscroll includes selections from an influential anthology of waka (“Japanese” poems) and tanka (short poems) intended for singing with musical accompaniment. Though the poems reflect the work of authors from many periods and of both Chinese and Japanese origins, the collection was first compiled in 1013 by Fujiwara no Kintō, a member of a highly influential family with close ties to the Heian imperial court. The original manuscript no longer survives, but the work has since served as a source of creative inspiration to countless artists, prompting the production of numerous beautifully decorated manuscripts in various formats and media. This particular version of the anthology bears the seal of Hon’ami Kōetsu, the famous designer and artist who along with Tawaraya Sōtatsu (fl. early 17th century) pioneered what would come to be known as the Rinpa style. 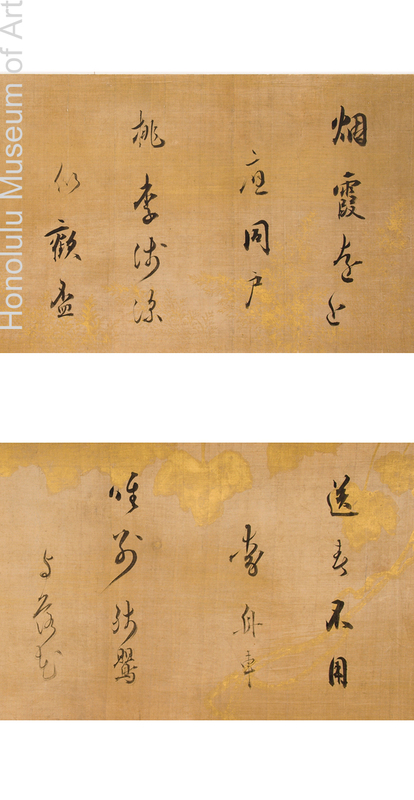 The scroll demonstrates Kōetsu’s mastery of both Japanese and Chinese calligraphic modes, featuring elegant kana and kanji cursive characters executed in the artist’s own hand. Kōetsu was celebrated for his skillful calligraphy as well as his exceptional design abilities. Like other copies of Wakan Rōeishū from the 17th century, the scroll features decorative vegetal motifs in gold and silver pigments that echo the themes of the verses they accompany. The Wakan Rōeishū is one of the most celebrated poetry anthologies to be produced by the refined court culture of the Heian period. Though the melodies to which these poems were meant to be sung are no longer known, the popularity of this subject during the Edo-period attests to the enduring cultural influence of classical literature in Japan.